Staff photo by Erin O. Smith / A section of Chattanooga Creek is filled with plastic bottles and styrofoam cups Wednesday, August 8, 2018 in Chattanooga, Tennessee. The creek was nearly impassible at a few spots where trash and debris had created a dam of sorts. 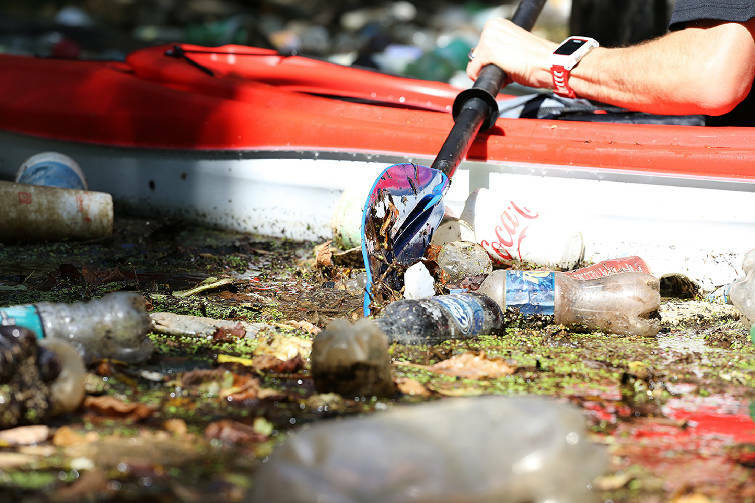 Staff photo by Erin O. Smith / Styrofoam cups, plastic bottles, bags and other debris makes certain sections along Chattanooga Creek nearly impassible for paddlers Wednesday, August 8, 2018 in Chattanooga, Tennessee. The litter found floating in the creek can be attributed to a variety of things, including trash being tossed from a passing car, remnants from several nearby homeless camps, trash collected in the city stormwater system landing the creek and storms pushing the litter into the creek. 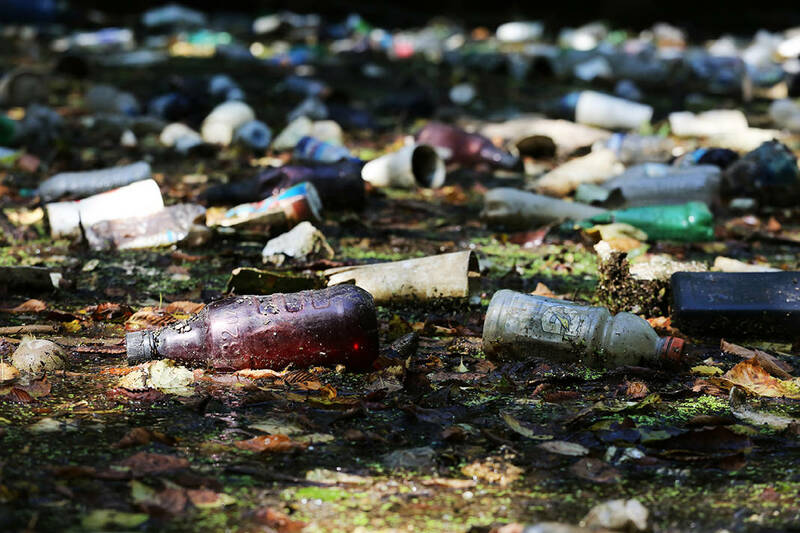 A deposit return program designed to drastically reduce the amount of waste in Tennessee will be proposed in the state Legislature early next year as supporters ramp up an effort to pass legislation that has been nearly 15 years in the making. The Tennessee Bottle Bill Project, also known as TennCan, would put the state on the forefront of recycling and litter control in the Southeast while joining a growing worldwide effort to reduce container waste. However, it would cost consumers more at the checkout line — a cost that can later be recouped. "What we're trying to do is make Tennessee more sustainable by recovering some of the most valuable commodities in recycling stream, which are the beverage containers," TennCan coordinator Marge Davis said. "We want to keep them from becoming litter and make sure they go back toward manufacturing at the highest level possible." The idea effectively works as a tax that citizens have the opportunity to reclaim, although supporters are hesitant to use the word. If passed, a 5-cent cost would be added to plastic, glass and aluminum beverage containers. Residents can receive their money back by dropping off their empty plastic containers at redemption centers that sort and recycle the waste. Proponents believe the program would boost Tennessee's 10 percent bottle recycling rate to 80 percent or higher based on decades of data from states with similar programs. They also say it would create jobs, support schools and provide more revenue for nonprofit organizations, which would be done through the redemption centers. Bottle bill project leaders adapted the bill over the years to include recommendations from the public. The bill no longer requires retailers such as Food City and Walmart to take part in container takeback efforts. The requirement that each redemption center must partner with a nonprofit beneficiary is also new to this bill. That requirement could be met by placing a bin at the front of the store for anyone who wishes to donate the nickels from their bottles to the group. TennCan organizers estimate about 500 redemption centers would be added across the state, with average earnings of nearly $169,000 annually per center based on estimated return rates for states with similar programs. The centers would be privately run out of existing businesses, nonprofit centers or as new businesses. Revenue would come from unclaimed deposits, scrap value and a fee on beverage companies using plastic bottles. The framework of the bill was created on the state level in 2004 but has been fought vigorously by beverage company lobbyists. The companies would be forced to pay three-quarters of a penny per bottle to partially fund the redemption centers. "Beverage containers are a very visible form of litter," said Susan Collins of the California-based Container Recycling Institute. "Beverage container deposit laws have been shown — even a weak law with only a five cent deposit — can cut beverage container litter in half. People aren't as likely to litter a container if it's worth five cents, and if someone does litter, someone else will come pick it up to get the five cents." Similar policies already exist in 10 U.S. states — mainly in the New England area and on the West Coast — and more than 40 countries and territories around the world. In those areas, litter rates have fallen drastically while recycling rates ballooned. Container-only litter dropped 78 percent on average, while overall litter decreased an average of 38 percent. The bill is sponsored by Tennessee state Sen. Frank Niceley, R-Strawberry Plains. A House sponsor is expected to be added before it is proposed in January. For Niceley, the bill is about job creation and limiting plastic waste. "It's really a jobs bill," Niceley said. "I'm a farmer, and the farm bureau has always been interested in this bill. They're the ones who always get the cans and bottles in their hay fields and pasture fields. Listen, it's not a tax. It's a deposit, and it trains your young children to be conservative and to save. And it keeps plastic out of the ocean, that's a big thing now." Clarification: This article was updated Aug. 20, 2018 at 10:35 a.m. to include that the legislation will also impact glass and aluminum bottle containers.